People in Vietnam’s Central Highlands and the southern region may have to celebrate the first rainy Tet in years, with the latest forecast on Tuesday showing that typhoon Sanba will approach the East Vietnam Sea right on the Lunar New Year’s Eve. 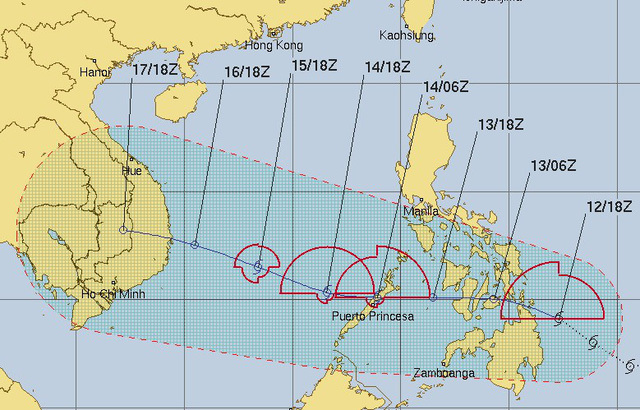 Storm Sanba, which developed off the Philippines on Sunday, is gathering strength as it heads toward Vietnam’s Truong Sa (Spratly) archipelago in the East Vietnam Sea, according to the National Center for Hydro-meteorological Forecasting. The typhoon is expected to make landfall in the southern coast of the Philippines on Tuesday afternoon, packing winds at 60 to 75km per hour and gusts at up to 100km an hour, the center said early the same day. As of Wednesday afternoon, the typhoon is forecast to head to the waters eastern of the Philippine island of Palawan, with the same wind strength, before moving into the East Vietnam Sea, where it becomes Vietnam’s second storm of the year. This Friday (February 16) marks the first day of the Lunar New Year, ushering in the Year of the Dog, in Vietnam. Called Tet, this is the biggest holiday in the Southeast Asian country. As of Thursday morning, or the Tet eve, storm Sanba is expected to reach a location some 450km northeastern off Truong Sa Island in the Truong Sa archipelago, packing winds at the same strength between 60 to 75km per hour. Le Thanh Hai, deputy director of the National Center for Hydro-meteorological Forecasting, said it is likely that the storm will weaken into a tropical depression upon entering the East Vietnam Sea. “The closer the weather condition gets to Vietnam’s coast, the weaker it becomes,” Hai said. The worst case scenario is that the tropical depression will cause unusual rain in the south-central, Central Highlands and southern regions, he added. This is the third time in two months Vietnam’s Truong Sa has had to face stormy weather conditions. Typhoon Tembin entered the East Vietnam Sea on Christmas Day, before storm Bolaven hit the area on the first days of 2018.